The description of a year in an orchard glosses over pest control, other than rodents and weeds because it deserves several paragraphs of its own. Apples are unfortunately attractive to a large host of organisms besides humans: insects, fungi, tiny arachnids called mites, deer and birds are the most common. Deer we attempt to keep separated from apple trees by means of fences. Birds we mutter and swear at, but in most years the damage is an annoyance but not a major financial calamity. In the 1995 growing season bites and tears by red squirrels caused significant crop damage in many orchards, but this is not usual. The remaining pests: fungi, insects, and mites we try to keep under control by a combination of horticultural practices, biological controls, naturally occurring predators, and when necessary chemical pesticides targeted to very specific problems. This approach to control of pests is called integrated pest management. A grower does not look at a calendar to decide when to spray. Instead, consideration of past and future weather, the stages of fruit development and pest development, and the pest population determined by scouting and trapping are all considered before a spray is put on. Scouting is done by apple growers or technicians who monitor traps and check a percentage of trees in each block for pests or pest damage. Various traps are used to attract specific insects by means of visual or pheromone odor lures. When the insects light on the traps they are entangled in a sticky substance. There they remain waiting to be counted. Research has established the number of catches that can be tolerated before significant damage occurs to the crop. When the threshold is crossed a grower will spray a chemical targeted to control that pest. Chemicals are applied by means of air blast sprayers pulled by tractors or, sometimes early in the season when the ground is too muddy to drive on, by an airplane. It is often done at night or early in the morning because that is when there is usually very little wind. This is important if the material is to land where it is directed. All people who use restricted use pesticides must either be a licensed pesticide applicator or have undergone pesticide handler training and be supervised by someone who has a license. The license from the Maine Board of Pesticides Control is initially obtained by passing a written test and renewed by attending lectures on safe pesticide handling, life cycles of various pests, recent research, and other topics that will help growers do an effective and safe job growing a clean, marketable crop. The pesticides used have been extensively tested for their effectiveness and safety There are restrictions concerning their use near harvest. The Food and Drug Administration samples fruit after it has been picked for pesticide residue. Residue on Maine apples has been non-existent or negligible. Growers have come to appreciate the help given by naturally occurring predators and so try to use pesticides that will be as benign to beneficial insects or mites as possible. In Maine in the case of aphids, at least, predators will adequately control the problem if given time enough and so almost no Maine apple growers spray for aphids. Mites are little spider-like creatures that destroy the green tissue of the leaves, and if a large enough population develops, will weaken the tree to the extent that it will drop most of its fruit too early. Natural predators will usually not be sufficient to control mites but will provide significant help in keeping the population in check until late in the season. A healthy predator population depends upon using chemicals for other problems that are not toxic to the predators. Horticultural practices such as keeping trees well pruned and open to air movement help combat problems by allowing for good drying conditions and good penetration of spray. Keeping surrounding woods and fields free of alternate hosts for pests will also lessen the need to spray. Early season mowing discourages two spotted mites. Research into the life of the pests in question has cut the use of pesticides. For example, apple scab, a fungus that growers spend more time and money combating than any other single pest, has been extensively studied with respect to the conditions necessary for an infection to occur. Scab spores which over winter in the apple leaves which fell the ground the previous autumn are released by rain at a time when the spores are mature and ready to shoot. Infection depends on the temperature and the length of the wetting period. Growers get information from University Extension specialists about the current maturity of scab spores, monitor the temperature during rain and the length of the wetting period and then look at a chart to determine if conditions were right for an infection. If so measures can be taken to combat it. Some growers use spore traps that face into the wind, sucking in the air and deposit any spores on a microscope slide. The trap has a switch that is activated by moisture and so turns on when it rains. The other approach used is to watch weather forecasts for approaching rain and to make sure that the trees are covered with a protectant fungicide ahead of time. Research has been done determining the time of day when infections take place. It may be that rain at night during scab season is not as great a threat as a daytime rain, if major infections take place only during daylight hours. Current research is studying ways to reduce the dose of scab spores available on the orchard floor waiting to be released and infect the trees. One such approach is the chopping of the leaves in the fall and application of urea to help them rot. The more knowledge available, the more effectively and sparingly pesticides will be used. Maine apple growers who belong to the Maine State Pomological Society support research with their dues. 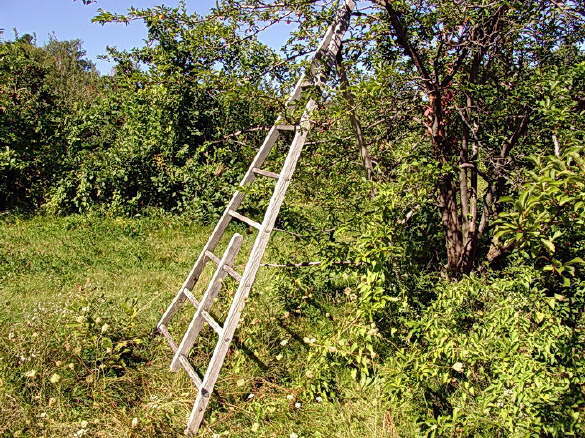 Integrated Pest Management is the approach used by apple growers in Maine. Its widespread adoption has often resulted in reduced use of chemicals which is better for the environment and definitely better for apple growers’ pocket books. It is an approach that is continually being refined.